Read the New York Times' Thomas L. Friedman's fascinating analysis of religious totalitarianism; "The Real Enemy." Many of us who live in the New York City metropolitan area ourselves work, or have friends or loved ones who work in downtown Manhattan, the scene of Tuesday's horrifying attack on the World Trade Center. Undoubtedly, some of us are grieving the loss of someone we knew personally. Collectively, we mourn for the thousands of individuals, honest working people like ourselves, who just a few miles away suffered an unspeakable horror at the hands of an enemy we can barely comprehend. Our hearts are deeply broken at this senseless and overwhelming loss of life. The words and faces of the countless family and friends whose lives have been so suddenly and tragically violated will haunt our thoughts for weeks and months and years to come. For many years the Manhattan skyline has been the glistening landscape of my own back yard, the awe-inspiring, ever-vibrant Emerald City of the Hudson. 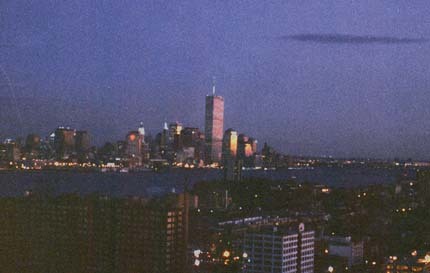 In 1977, while living on West Houston Street in Greenwich Village where my small apartment boasted an unobstructed view of the top third of the shiny new World Trade Towers, I witnessed a tiny black speck moving slowly up the northeast corner of Tower One that proved to be George Willig, the "human fly" who scaled the full 110 stories to the top, eclipsing the infamous tightrope walk by Phillippe Petit three years earlier. For the past fourteen years, from my high-rise apartment atop New Jersey's Palisades, I have derived great pleasure from the breathtaking power of these man-made wonders, often racing for my camera at the crack of dawn, or at that magical twilight hour when the golden sunset flashes on the tall glass structures like glittering jewelry as the stars begin to dance against a deepening blue sky. Tonight, in the place where the great Towers once stood is a ghostly white corona, a colossal cloud of dust and smoke eerily illuminated by the floodlights guiding the rescue crews for whom tonight, again, there will be no sleep. The following was written by me on September 11, 2001, at 11:45pm. I took photographs of the scene from my balcony, which you may view by clicking here. 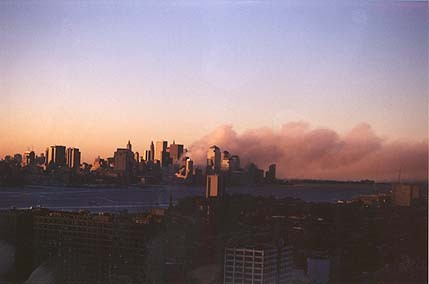 It was utterly surreal this morning to be standing on my terrace in Union City, NJ, watching the beautiful Twin Towers I'd admired from this vantage point for 14 years, now topped in strangling black clouds of smoke and wisps of vivid flame. I stood numbed in disbelief when suddenly, the long sliver of the south Tower I could just see behind the north began to spew a cascade of filmy gray matter, like a dark waterfall, from its sky-high pinnacle down towards the ground. It was difficult to immediately discern what it was I had just seen through the smokey shroud, but when I next noticed monstrous clouds of thick, rolling white powder rising 50 stories up from the ground around the cluster of downtown buildings, tumbling and rippling wide into a half-mile radius around the site of the Trade Center and spilling deep out into the harbor -- I knew something doubly disastrous had happened. I dashed into my living room to see what the TV news was reporting, and learned that the south Tower had in fact completely collapsed. Reeling from the shock of this, weeping in horror for the thousands of people obviously lost, both in the tower and on the ground, slowly trying to grasp that the endangered north Tower had finally lost its twin, and contemplating what a sad and devastating reminder it will be to see the lone Tower standing where this double monument had stood for nearly 30 years, sentinel to the world's most magnificent skyline -- I was physically shaken when suddenly the remaining north Tower started to drop, like a vertical accordion, straight down in a wobbly but steady descent, in a liquid-like halo of dark dust, literally sinking out of sight from the New York City landscape. The empty space in my familiar view will forever sting as a sad reminder of the innocent lives horribly taken, the heroism of the rescue crews victimized at the scene, and the deep loss felt by the friends and family of those fellow Americans we lost on this tragic 11th day of September, 2001. Peace to all of us. Many of our friends and family have had poignant personal experiences related to this event. I will add them as the stories accumulate. Particularly touching is a message from Frank Miale, a retired fireman friend. See personal stories. A remarkable and chilling detailed account of survivor Adam Mayblum 's descent from Tower 1, floor 87 can be read here. For information, opinions, and commentaries, see political and other commentaries.